Robert Plant brought his current project, the Sensational Space Shifters, to their first U.S. festival on Thursday as opening night headliners at High Sierra Music, a long-running boutique music festival in Quincy, California. The band, which features an international lineup, brought influences ranging from Delta blues to new electronic forms. The ensemble, under Plant's leadership, reinterpreted Led Zeppelin classics alongside traditional blues and roots covers during a 90-minute set that felt like equal parts nostalgia and history lesson. The show opened with the traditional folk number "Babe I’m Gonna Leave You," made famous by Joan Baez before Led Zep highjacked it as their own on their 1969 debut. If Plant's dedication to exploring authentic roots music wasn't clear from the start, it was made obvious when the band launched into Zeppelin’s all-timer "Black Dog," which the Space Shifters radically shape-shifted into a much more mellow blues arrangement. 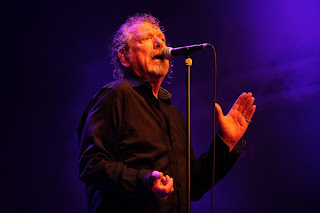 "Welcome to another night of bluegrass and soft rock," Plant told the crowd. "That's how we got here." Lest anyone think he was joking, Plant then led the band into a cover of Willie Dixon's "Spoonful," which he introduced by saying "That dead guy got here the same way we did." Banging on a hand drum for much of the show, the band's African and Middle Eastern tendencies were seated in territory that Led Zeppelin always flirted with but couldn't fully commit to because they were too busy breaking ground, exploring their own, original sound. Of course, the softer, more acoustic and rootsy treatment of Zeppelin hits should've been nothing new to fans who have paid attention to anything Plant has done in recent decades. Meanwhile, younger fans who never got a chance to see Led Zeppelin's magic during their touring days were just happy to hear Plant sing favorites like "Going to California" – which, as it turns out, was the perfect song for his new gang to tackle. Also (and this is no surprise either), it turned out to be the perfect tune for a singalong under California stars. The set included material ranging across Plant's entire career, including newer tunes such as "The Enchanter." If those songs didn’t get the same response as, say, "Rock and Roll," they certainly flowed seamlessly – so much so that a newbie wouldn't have known the difference between the new originals and Zeppelin standards had it not been for the difference in crowd reaction. Nodding flippantly to the Fourth of July holiday, Plant finished his show by congratulating Americans on the "anniversary of your independence" and of "breaking free of that mad King George." High Sierra Music Festival continues throughout the weekend with sets from Primus, Thievery Corporation, moe., Steel Pulse and others.